As the transition to digital takes hold, the focus is increasingly on automation and on the efficiency gains born of technological improvements. The race for industry competitiveness is heating up, and so too is the drive for higher productivity among a great and growing number of industries. Much changed from that of years past, this new operating environment poses something of a challenge for businesses, particularly those in managed print services (MPS), which have seen opportunities within their industry transform almost beyond recognition in recent times. The death of print services has been overstated of late, mainly by ill-informed sources. In fact, most in MPS are optimistic about modest growth prospects for now and in the coming years. Print volumes may be nearing their peak, but advances in IT mean that a number of new growth opportunities have presented themselves. On this note, European CEO spoke to Chris McFarlane, CEO of PrintFleet, about the various ways in which the company has adapted to the new operating environment, as well as what opportunities and challenges lie in wait for the MPS industry. MPS is getting broader, yet companies claim to be getting back to basics. How can this be the case? Resellers are expanding their service offerings under the umbrella of MPS, in order to meet growing customer expectations. This means MPS is no longer simply managed print services, but has come to include document management, IT services, network management and countless other business processes. The notion of ‘getting back to basics’ means something different to resellers than it does to customers, effectively highlighting the two sides of the print management coin. For customers of MPS, getting back to basics means taking a holistic approach – viewing MPS as a strategic component of the entire business. Resellers, on the other hand, are focused on streamlining their own business processes and providing the most efficient MPS offerings to their customers. This means thinking of MPS as one piece of a larger business management puzzle, automating internal processes and outsourcing other facets of MPS that customers have come to expect, in order to drive efficiency, reduce costs and increase productivity. How has automation altered the operating environment? In today’s fast-paced operating environment, automation drives enormous efficiencies at all levels of the imaging industry service and supply chain. Put simply, automation is becoming a business imperative, as companies continually strive for increased productivity and competitiveness. At its core, automation reduces the number of human-to-machine interactions necessary in an operating environment. It makes business processes repeatable, scalable and reliable, while meeting the needs of many. By replicating processes consistently and with better precision, the probability for error is minimised. This leads to a more streamlined business and enhanced productivity. What is the internet of printers, and how has it changed the industry landscape? Printing of all sorts involves people, machines, consumables, data, software and the underlying network that connects them. PrintFleet enables seamless machine-to-machine and machine-to-human interactions through the internet of printers (IoP). 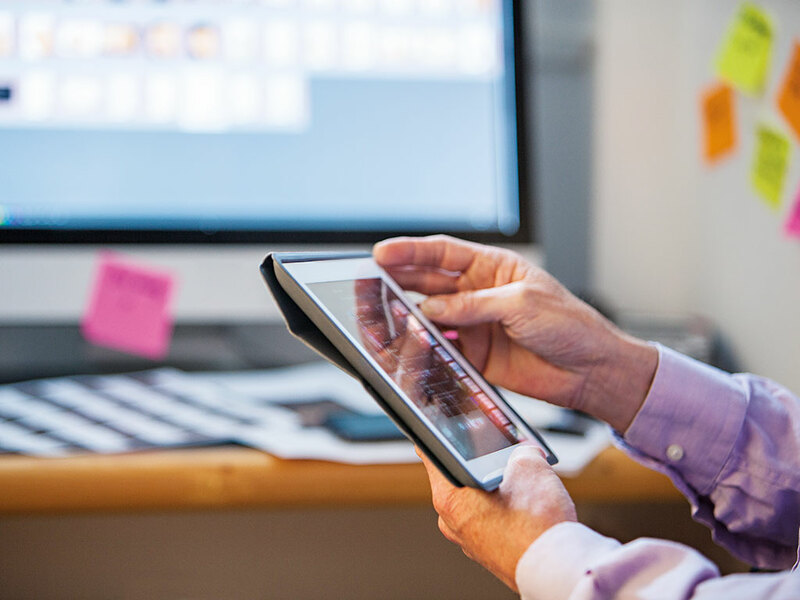 In this hyper-connected world, where all devices are increasingly becoming connected through the internet of things (IoT), our industry often forgets that print devices can lead this smart capability. The IoP helps our partners proactively manage service, consumables and usage, effectively improving the manufacturing process, reducing costs, increasing efficiencies and driving automation. What are the biggest challenges and opportunities for the industry at the moment? The issue of scale in a market sector that will, with virtual certainty, involve less print in the near future may seem like a challenge. However, given that in a shrinking environment only the strong survive, PrintFleet’s approach to data, automation and outsourcing affords clients efficiencies and assurance regarding the use of available information. Connecting diverse businesses with meaningful information and offering them ease and speed of processing ensures the greatest chance of success. While the overall print market may decline, the number of devices that can be effectively managed will increase. As with other modern sectors connected to the IoT, there is ample opportunity for those solution providers who bring efficiency to the industry to rise above the crowd and stay ahead of the competition. What is it that differentiates PrintFleet from industry competitors? For over a decade, PrintFleet has been focused on the value of data and its effective use. As a result of this commitment, PrintFleet has become a global leader and trusted partner in the imaging industry. Working with all major manufacturers and pulling from a model database of over 22,000 distinct devices, PrintFleet is able to collect, analyse and report the most accurate, reliable data. PrintFleet has built an extensive community and offers unparalleled support for partners, employees and the industry. We believe in connectedness, an idea that goes beyond simple integration – the bringing together of businesses, services and even people. To us, connectedness means the ability to choose. As a truly agnostic company, we provide flexible solutions that empower our customers to choose the partners and services that best meet their needs. Can you tell us about PrintFleet’s services and how they’ve evolved over the years? Recognising that there was value in being able to determine which toners were in demand, PrintFleet founder Brian Cosgrove hired a small team of devoted developers to design a software system to capture, analyse and report on key device metrics from networked printers and multi-function devices. This led to PrintFleet Enterprise, a standalone MPS software solution for the imaging industry, which effectively met the needs of OEMs, distributors and resellers. Over the last decade, as the landscape of the industry has evolved, we, too, have gotten back to basics, focusing on what we do best – data. Accurate, reliable data provides actionable information for businesses, allowing them to make better business decisions, increase efficiency and streamline business processes. In order to reduce the resources necessary to manage MPS software, PrintFleet developed Vision, a software-as-a-service solution and the next step towards ubiquity in the evolution of PrintFleet’s service offerings. Seeing the need for automation, the need to get back to basics and the value of selective outsourcing, we created our LINK platform, a data-as-a-service solution which drives automation and efficiency throughout the service and supply chain. LINK leverages the machine-to-machine connections of the IoP, effectively enabling just-in-time supplies, proactive service, analytics and other LINK-enabled solutions from leading global distributors. LINK empowers resellers to meet the growing expectations of their customers, to focus on their strategies, leverage their strengths and outsource the rest for greater efficiency, reach and expertise. What plans and ambitions do you have for the future? We want to continue to be the solution of choice by empowering businesses to get connected. Placed at the epicentre of the industry, our future is built on connecting businesses, services and solutions that facilitate commerce, foster industry growth and drive innovation.